Google crawlers index each and every website on the web; no matter what the site is about, it would be indexed by Google one day (if you are allowing Google bot to index your page) but the problem is that these crawlers take many days and sometimes weeks to index a new website or a new URL. So, today I will share a simple but underestimated tool that can get a website or a URL indexed in minutes and sometimes in seconds too (I got my WordPress post indexed in 2 seconds with this tool!). A few months back, I had shared breaking news on my blog just after it took place; my blog was first to publish the news but my post was indexed after five days of it getting published. So, I got no benefit of being the first one to post the news as my post got indexed after five days when the news became old and when no one was searching for it. I wish I knew about this tool then. But now I know about it and I get “most” of my WordPress posts indexed by Google in minutes. The simple tool is called “Fetch as Google” which you can find inside your Google Webmaster Tools control panel (You can only index those website with this tool which you have verified in Google Webmaster Tools). 1. Sign in to your Google Webmaster Tools Account. 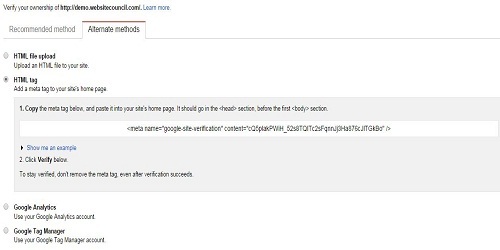 Note: If you’ve already added your site in Google Webmaster Tools and it has already been verified then skip to step 6. 2. Click on the red button that says “Add A Site” to add your website in your Google Webmaster Tools account. 3. You will see a popup box; enter your website’s URL in the text box of that popup box and click on “Continue”. 4. Now, you’ll be asked to verify if you actually own the website you just submitted. To verify, use the “HTML Tag” option (if you don’t see this option, you can click on “Alternate Method” tab which would display this option) as it’s very easy. Copy the meta tag that Google provides and paste in to your site’s HTML code, above </head> (if you don’t know how to do this, comment here with the CMS you use and I will be more than happy to assist you). 5. Now, click on “Verify” and ownership of your site should be verified if you pasted the meta tag on your site. Note: If you’ve already submitted your website’s XML sitemap to Google Webmaster Tools, skip to step 9. 6. Click on your site from Webmaster Tool’s Dashboard. 7. Expand “Crawl” option on the left sidebar and then click on “Sitemaps”. 8. Click on the red button on the right side that says “ADD/TEST SITEMAP”, write the name of your XML sitemap and click on “Submit Sitemap”. 9. 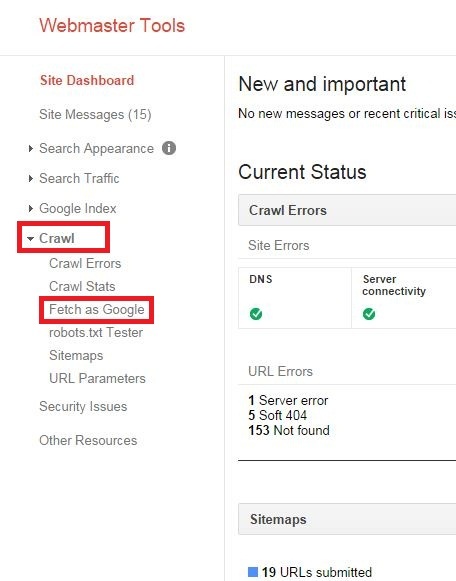 After submitting your XML Sitemap, expand “Crawl” option again and click on “Fetch as Google”. 10. Enter the page of your website you want to get indexed by Google in the text box provided or leave it black if you want your site’s homepage to get indexed and click “Fetch” button. 11. After completion, .click on “Submit to Index” button situated right side of the URL you just submitted and choose the option which says “Crawl only this URL”. 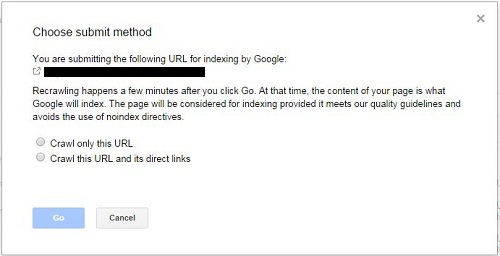 (You can also choose “Crawl this URL and its direct link” if you want Google to index all the pages of your site that URL links to) and then click on “Go”. 12. Wait for a few seconds and then Google: “site:<the URL you submitted>” and you’ll see your URL in Google’s search result. Note: You can only fetch 500 URLs per Week with “Fetch As Google” tool. You can not submit more than 500 URLs in one Week to index using “Crawl only this URL” option and 10 URLs in one Month using “Crawl this URL and its direct link”. I hope this tutorial helps you; if you need any help, feel free to use the comment box below. OMG i am using Google Webmaster Tools but i didn’t know the actual use of this. Thanks for letting me know this sweet trick. Hi, Thank you for letting us know this tip. I used this feature earlier but I don’t know that this will index your url so quickly. But should we submit the xml sitemap compulsorily before we go for “fetch as google”? Nope, XML Sitemap is not required but recommended. 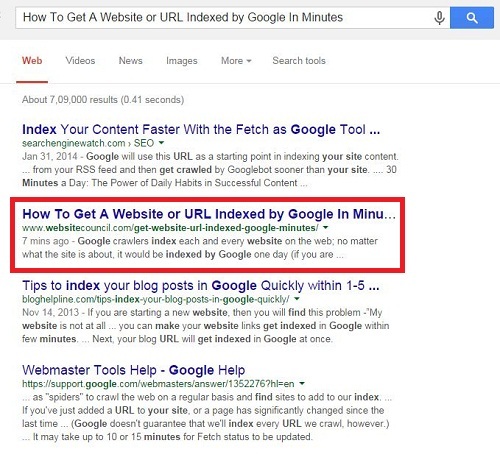 “Fetch as Google” helped my pages get indexed in less than 3 minutes.